People with disabilities can augment all aspects of their lives with service dogs, who execute crucial aid depending on the disability of their owner. The Americans with Disabilities Act (ADA) stipulates that service dogs are specially trained to assist a person with disabilities in their tasks and daily life. The tasks that service dogs perform are essential actions, like guiding people with visual impairments, signaling certain sounds for those who are deaf, retrieving items for people with mobility issues or alerting about impending cardiac episodes or seizures. Aside from these physical aids, service dogs also have other advantages that enhance emotional well-being from their unique bond with their owners. Different disabilities require specific things from service animals, and their training even differentiates this for them before they start working with a person with a disability. Service dogs undergo training for social situations, behavior requirements and specialized disability care. At Canine Partners for Life, service dogs complete two full years of training before being matched to an individual with a disability. 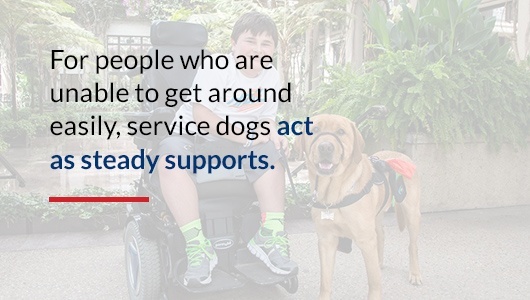 Service dogs support people’s physical disabilities in a variety of ways. Often their alerts are preventative for conditions like epilepsy and dysautonomia. But many of their tasks are household actions like turning on lights and providing stability for their owner for standing, walking or transferring out of a wheelchair. For people who have limited mobility, service dogs provide physical support. Mobility assistance dogs can open doors for those in wheelchairs, manipulate light switches and pick up objects off the ground or retrieve them from other spots. Individuals with limited mobility may need the dog to help switch from their wheelchair to another position, like their bed or a toilet. Dogs can also unload laundry from the dryer. Some other capabilities of service dogs are paying cashiers, pressing handicapped accessible buttons and pressing elevator buttons. People with epilepsy have service dogs who are trained to alert their human partner before a seizure occurs which helps prevent injury during a seizure. Seizure alert dogs have an innate ability to detect the onset of a seizure. When they sense an imminent seizure, the dogs give their owners a signal like pawing, pacing, intense staring or placing their head or nose on their owner. During a seizure, service dogs will lie down close to the person having the seizure. If the alert is seen in time, individuals with epilepsy can prepare themselves and get to somewhere safe, such as on a soft surface or on the floor, before the seizure happens. After the seizure is over, the dog may go and seek additional help if it’s needed. For individuals with disabilities that cause fatigue, pain, trouble walking, or limited mobility, service dogs can help! Like the mobility tasks for wheelchair users, service dogs can also help people regain balance and prevent falling. The dog can carry items if the individual is too weak to move or hold them. Because service dogs are allowed by law in public places for the benefit of their owners, this means they can perform these assistive tasks in the grocery store, on the sidewalk and other public areas.Using a service dog for balance can help when unstable walking and stumbling occur. Service dogs are trained for various bracing maneuvers to prevent falls, provide secure footing after making a difficult move and recover control. Overall, service dogs allow a greater level of safety for individuals with disabilities. Whether a chronic illness or a mobility impairment is hindering your routine and fundamental practices, expertly trained service dogs can become your partner in many activities. A service dog as a team member can work with you to transport items, help you move from place to place and keep you healthy. They can retrieve medicine, first-aid kits or insulin kits. Gaining a service dog means adding a loyal companion to your life that goes beyond typical canine devotion. A service dog can help and accompany you in many situations, and many service dogs can keep you accountable if you neglect proper management of their chronic illness or disability. This sense of security and consistent care will take some of the burden of your illness or disability off of you. Additionally, with a service dog, you’re not alone. It’s very easy to feel isolated when a condition limits your ability to complete everyday tasks, but a dog provides companionship that can ease feelings of loneliness. You can rely less on other humans for help with tasks such as carrying something or opening a door. Instead, you can transfer your needs to your service dog, who is constantly available to assist and ready to be helpful.The toll of relying on other people for daily tasks can wear on you after a while, and despite eager family members and others who will step in, you may feel you are restricted and dependent on others. A service dog reduces or eliminates that feeling and brings back a sense of freedom. Owning a service dog not only cultivates personal happiness, but it also increases socialization for people with disabilities. 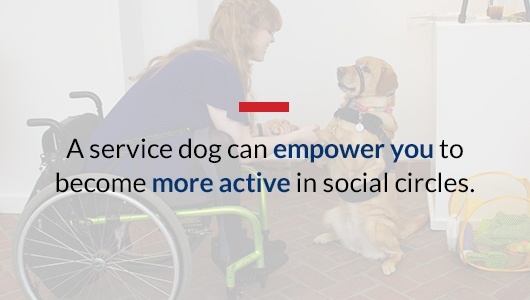 A service dog can empower you to become more active in social circles. Because you have your companion, you feel more comfortable in situations that you might previously have expected to be tiring or be unable to participate in. You may also notice you’ll get attention from passersby. Though your dog is always on duty, and strangers cannot interact with your dog, this scenario is another way conversations and positive social interactions can be initiated. Even relationships with relatives are improved by the presence of service dogs. They are less worried about the person with a disability when they are absent. Home life with family members is less stressful with the aid of a service dog, too. Relationships can flourish when the service dog bears some of the responsibility in caring for a person and can alleviate some of the demanding tasks of the main caretaker. Experiencing pain and challenges every day weighs many people with disabilities down, and fluctuations in health are taxing. Service dogs can help you regain motivation to handle the potential challenge of daily chores and bring some joy in day-to-day activities. A service dog still requires care from their owners, too, so that dependence and connection between dog and human creates a reason to keep going. A service dog allows many people with disabilities to do things they did not think were possible and to frequent public places with less worry. The hope for new possibilities and further improvements that a service dog brings is comforting. People with disabilities can entertain ideas they did not think they could attain and set goals they did not think they could reach. The benefits of service dogs for disabled individuals include many positives, but an optimistic view of the future is a significant one. If you’re not sure your disability is extreme enough to have a service dog, decide whether your day-to-day life would become significantly easier and safer with the help of a dog. Getting a service dog does not happen immediately, as there must be a good fit between you and the dog as well as one that is trained specifically to cater to your disability. Service dogs also go through training for obedience, advanced disability service and personalized needs. This takes time, but if you are willing to invest in the system and training, you will have a trustworthy companion and service provider in your dog. Canine Partners for Life works to improve the quality of life and increase independence of those with disabilities by pairing them with professionally trained service dogs. 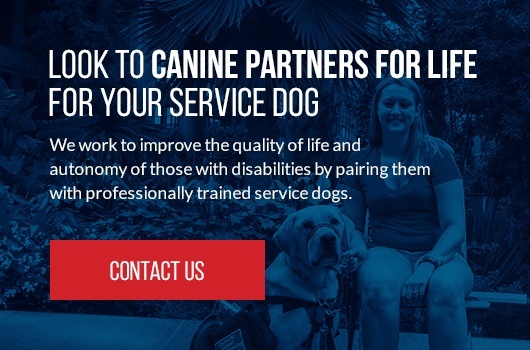 Our program includes follow-up training and support services to ensure our service dogs meet and connect to the unique situation of a person with a disability. Contact us to learn more about service dogs and the training process.